This page is dedicated to first-person shooter VR games for the leasing VR headset and platform, including but not limited to HTC Vive, Oculus Rift, PS4/PlayStation VR (PSVR), Google Daydream, Cardboard and Gear VR. 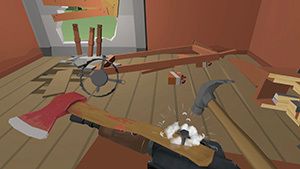 FPS games in VR have gained a lot of attention and are the most popular ones. 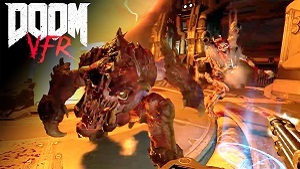 Many agree that playing FPS games in virtual reality is a much more intense and satisfying experience to a non-VR shooter. Being able to get into the shoes of a soldier in an intense combat is a superb experience like no other. Now you can literally get into the battlefield and feel the action all around you, hear the bullets fly by above your head and feel the explosions and the intensity of the battle in such an immersive way you haven't felt before. 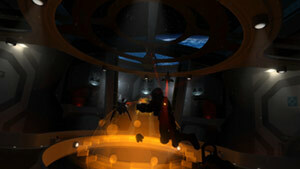 In this page, you can find a list of all best and latest VR FPS game indexed on our website. Many of those games aren't just military-based games. 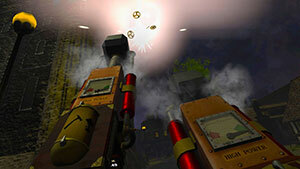 In some games you can shoot with a bow and arrow, others are cartoonish zombie shooters, others employ very futuristic weapons and some are just gallery shooters in which you need to shoot stationary or moving objects. 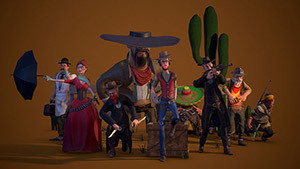 Some of these games aren't limited to single-player gameplay as well, some employ a competitive or co-operative multiplayer game modes (or both), allowing you to play against other online players from all around the world in intense competitive matches. There is nothing better than creating a squad and inviting your friends to fight alongside you against another team for an objective. 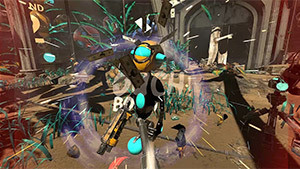 Video games like Raw Data, Hover Junkers, Drop Dead, Serious Sam VR: The Last Hope, Superhot, Space Pirate Trainer and Arizona Sunshine already made a great name for themselves in that particular genre, showing how amazing it is shooting and blowing up stuff in virtual reality. 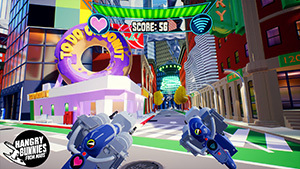 Many of those shooting games support tracked motion controllers and gun-shaped controllers like the PlayStation VR Aim Controller, which are designed to give users a better sense of presence and immersions, by simulating the physical rifle handling both with the control and in-game. 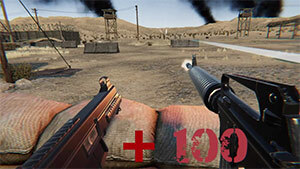 This allows gamers to feel like they actually shooting with a real gun, which makes all the difference in the world for these type of videogames. I personally waiting for Battlefield VR deathmatch game with freedom movement locomotion, but until this day comes, I know that I have tons of cool first-person shooter games to play and enjoy. This category is being updated with new games on an ongoing basis, so don't forget to check this page frequently—happy shooting! Trapped in the void between death and rebirth, embody the essence of a Tibetan archer and confront hordes of reanimated and corrupt Tsen spirits. 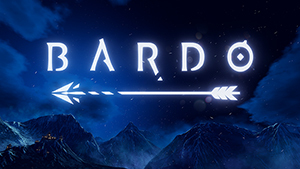 Built exclusively for VR, BARDO is a fast-paced, atmospheric action game offering the most satisfying and challenging archery experience to date. 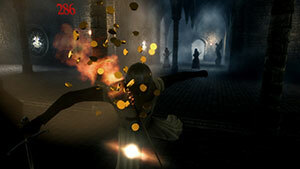 The genre-defining FPS comes back, this time in Virtual F Reality ! 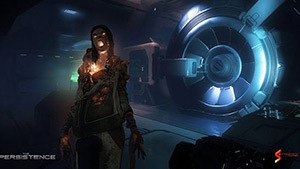 The Persistence is a Sci-fi horror game for PSVR featuring procedurally generated maps. The game sets in the year 2521. It tells the story of a group which is studying a black hole. Something went terribly wrong after one of the experiments and the some of the crew got mutated and attack the other crew members. The ship decided to wake up crew members at a time, those who are in deep sleep. Each character you play will have a different game play experience. 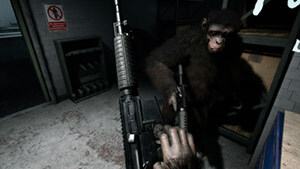 In Crisis on the Planet of the Apes, you play as an ape with advanced intelligence. You were captured and held in a heavily guarded scientific facility by humans as they search for a cure. Your mission is to confront the human aggression and fight your way out in this apocalyptical world and get back to your fellow apes. 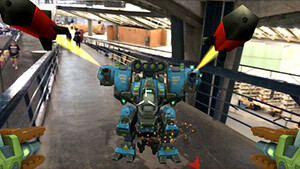 One Man Army VR is a room-scale wave-based first-persons hooter where the player needs to defend the based and prevent enemy's invasion while earning money which can be used to purchase more weapons. Skyfront launched on Steam Early Access on November 10th 2017. 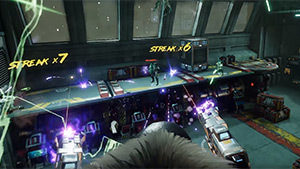 The game is a fast-paced multiplayer FPS in VR that boasts fluid omnidirectional zero-G arenas. 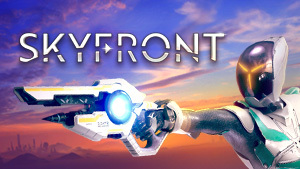 Skyfront's innovative approach to locomotion makes for a refreshingly immersive experience that all but eradicates VR induced nausea.